Toppenish National Wildlife Refuge (TNWR), established in 1964, is situated in the Columbia Plateau ecoregion. It consists of 1,978 acres of brushy creek bottoms, wet meadows, sagebrush uplands, and croplands located along Toppenish Creek and spread over 27 miles of the Yakima Valley. The refuge's combination of grassland, riparian, and seasonal wetland form an important resting and feeding area, for up to 30,000 migrating waterfowl, large concentrations of shorebirds, and other birds migrating along the Pacific flyway. 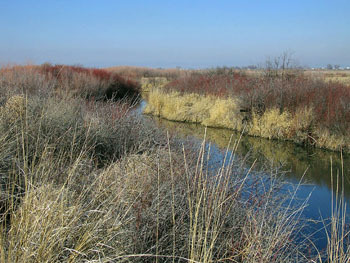 The refuge is home to many species dependent on the shrub-steppe habitat of the area. Species such as Western Meadowlark, Northern Harrier, Black-billed Magpie, Yellow-headed Blackbird, Lark Sparrow, and Common Raven are found year around. Loggerhead Shrike, Lazuli Bunting, Savannah Sparrow, Common Nighthawk, Gray Catbird, and Long-billed Curlew are regular in summer along with, on rare occasions, Sage Sparrow. In winter, you will find Bald Eagle, Prairie Falcon, Merlin, Short-eared Owl, Northern Shrike, Rough-legged Hawk, and the occasional American Tree Sparrow. Most productive birding is in spring and winter (good for raptors). From Toppenish, take Route 97 south approximately six miles. The refuge entrance is on the west side of the road. When you enter from Route 97, the first parking area you come to is the Wildlife Observation Overlook. Regulations and hunting restrictions are posted there and in the headquarter kiosks (HQ). The overlook area is a productive place to view one of the ponds and adjoining riparian stretches of the creek. The parking area is also the starting point for a short trail that follows Toppenish Creek through the grasslands west to the HQ. If the gate to the HQ is locked, you can still use this trail and bird the area surrounding the headquarters. If the gate is open (usually only during hunting season), you may drive to the HQ and park there. Visitors to the TNWR will find it well worth their time to bird the nearby areas along Toppenish Creek. From Route 97, you can make a loop by driving west on Pumphouse Road, nine miles to Lateral ''C'' Road (look for a nesting Bobolink colony in May and June), and then north to Marion Drain Road, east to Old Goldendale Road, south to Pumphouse Road, and back to Route 97. The only area of the refuge that is open to the public year around is in the southeast portion of the main refuge, from Route 97 to the refuge headquarters. Warning: Beware of ticks in spring and summer.